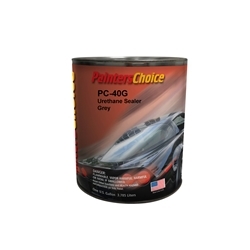 PC-40G Urethane Sealer Grey is a premium quality, two component wet on wet grey sealer. This product offers good adhesion to properly prepared bare metal surfaces and properly prepared automotive plastics. PC-40G Urethane Sealer can be used over factory e-coat metal parts and previously painted surfaces. This 4:1:1 sealer must be activated with PC40A activator, and reduced with PC870 reducer.